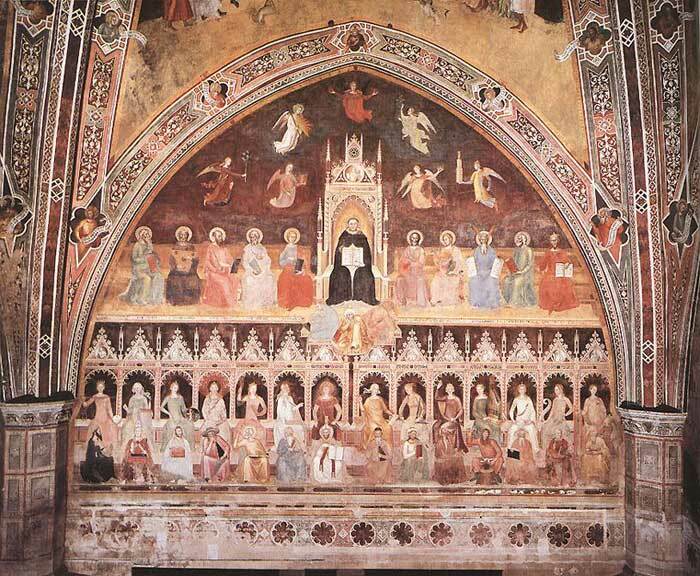 Triumph of Saint Thomas Aquinas, by Andrea Bonaiuti (1365-68). Our enemies attack two things: our holy doctrines and the Primacy of Petrus. The mission of Marie-Julie is to bring back the doctrine of the Church and to announce the future chastisements. It is also to suffer in expiation for the sins of mankind, and in order to soften the terrible test that awaits the world. --Oh! Good Mother, the place is only reserved for their elected and, me, I am no more than a ground-up worm, worm food and indignity! --Whatever you want, my Mother. --I do not say I see it… But I sense it by the weakening of human forces. --Oh! my Mother, do not be shy. It will not hurt; on the contrary, it will delight me so much that my joy will become jubilation. --Oh, my Mother, I will be there again… I will follow thee everywhere. I will love thee so much that thou will not be able to go without me. [Source: pp. 19-20, Le ciel en colloque avec Marie-Julie Jahenny, by Fr. Pierre Roberdel]. This prophecy brings the subject of what will end the Exile of Holy Mother Church. This prophecy reveals the only thing that can bring the Exile to an end—the Three Days of Darkness. This is revealed when the Virgin Mary asks Marie-Julie if she can see the end of the Exile, and Marie-Julie has to admit that no, she does not see it. Our Blessed Mother mixes no words. She immediately speaks to our separation from everyone that we know in this world through death. It would be after the Three Days of Darkness, when the faithful have made it to Brittany and together, we are helping each other to survive. The purpose of these apparitions would be to comfort and guide us. Our Holy Mother may also be giving guidance to the Holy Father and to the French Monarch about the Papal Restoration. Marie-Julie is a great missionary! The fishermen are the Apostles, the bishops. Recall that Christ said to his Apostles, who were fishermen, “I will make you fishers of men”(Matt. 4: 19). The Virgin Mother of God knows that the good bishops who are the watchmen for the Church, are to be shut out themselves so that they become ineffective. The hardening of hearts, which is a symptom of our times, and a true disease of the soul, is at work in making the good bishops obsolete, pushing them into a forced retirement. Recall that prior to the masonic takeover, bishops stayed in their posts until death. It is a case of ‘out with the old [the Catholic], and in with the new [the masonic],’ and a necessary part of the Silent Exile. The good bishops had to be removed, silenced by retirement. Even the Archbishop of Genoa, Pope Gregory XVII, born on May 20, 1906, was forced into retirement in 1987, at 81 years of age. But God will not permit such unholy outrage for long. And what consoles our Good Mother, who does not want to see anyone die in their sins? By knowing about the silent masonic takeover, souls will align themselves spiritually to the Pope in Exile. Perhaps in this way souls will not die outside the Church! Remember, it is a dogma: Outside the Church, there is no salvation.